This Galaxy Tab 2 is a sensible package for a reasonable price. Alright, it may be short on thrills - but what matters here is it's good at the essentials. And not just good enough - it's a great portable video player and the browsing experience is top notch too. Ice Cream Sandwich, full telephony support and memory expansion are the immediate benefits over the original Galaxy Tab. Are they enough to justify an upgrade? Most likely not - if you have the original 10" Samsung tablet, the Note 10.1 is the device to look at. Or, you can simply wait for the ICS update, which shouldn't be too long now. Alternatively, if you're about to get your first tablet, or planning an upgrade to a bigger screen, the Tab 2 10.1 looks like a reasonable choice. And one that won't put a big dent in your budget either. 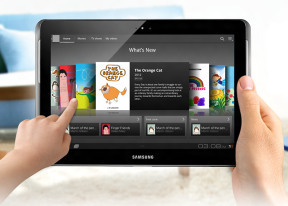 With the launch of the Galaxy Tab 2 10.1, Samsung are ready to match the price and beat the specs of the iPad 2. The screen resolution is nominally higher - but the aspect ratio is the bigger advantage. The expandable memory and voice calls are also points in Samsung tablet's favor. The wide video codec support and Flash in the browser count too. Essentially, an Android tablet is the natural choice for users who won't put up with the confines of a closed ecosystem. Of course, others will appreciate the better stocked app store and the slightly smoother experience. Another second-gen alternative to consider is the Motorola XOOM 2 3G. It has the same screen, chipset and battery but will have to wait a little longer for an update to ICS. A proper microUSB port and HDMI are nice touches but it doesn't offer voice calls and will have trouble matching the rich media-playing capabilities of a Samsung tablet. The ASUS Transformer (the original one) is a worthy competitor too. It's already been updated to ICS and is one of the hottest slates on the market. The 10-incher is powered by the Tegra 2 chipset and has an 5MP still camera with 1080p video recording, 16/32GB of storage and a miniHDMI port. An optional keyboard dock features a full laptop-like QWERTY keyboard, complete with an extra battery, USB ports and an SD card reader. It lacks 3G connectivity, though so you should only consider it if you always use your slate near a Wi-Fi hotspot or if you plan to use your smartphone as one. The Samsung Galaxy Tab 2 10.1 inhabits a niche that's hardly too crowded - affordable 10" slates are not easy to come by, so it should have plenty of market potential at launch. The problem is, the niche itself might seize to exist in a few months' time as quad-core slates' prices start to drop. But hey, there's always something newer and better just around the corner and if you don't feel like waiting another 6 months before getting your tablet, going for the Galaxy Tab 2 10.1 is a move you are unlikely to regret.